A step by step guide on surviving the Taken Consumption and opening the chest. How to defeat the Cabal in their Prison of Elders arena. 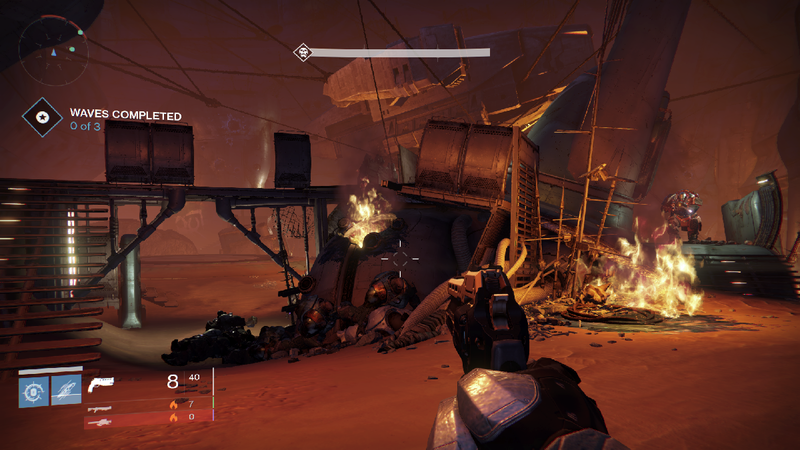 The Cabal are a tough opponent to break, and their Prison of Elders arena is no different. Shield Phalanxes, Psions, and the deadly centurions will be swarming you from all directions while you try to survive and deal with any objectives that come your way. You’ll need to bring you’re a game if you’re going to make it out of this one alive, so read on for some tips and strategies. Every Prison of Elders Arena guide includes this tip, but it’s essential in every one. Working as a team is the most important factor when it comes to making it out of a PoE arena victorious. Leave your team and you risk getting flanked and killed which means your teammates have to risk their lives coming to revive you. If you’ve got a microphone make sure you’re using it. Even if some of the other teammates don’t have one, you can let them know what you plan on doing allowing them to follow suit. Also be sure to call out any enemies that approach your position. Your best bet for a safe spot to camp is the tunnel you run into immediately after coming through the entrance doors. Here you can pop your head around the corner on either side to snipe any enemies that may be getting too close. The only thing you have to watch out for is the splash damage from missiles fired by centurions and colossus. Titans would be well advised to use their Ward of Dawn during times of heavy enemy fire to protect your team from the blasts. Solar weapons are usually a good bet against the Cabal to take out the centurion’s shields, but be sure to check what the modifier is that week as well. Also try to use precision weapons instead of shotguns. This is so you’ll be able to more easily target the heads of the massive cabal, which go down a lot faster when shot in the dome. The Icebreaker sniper rifle is particularly deadly against cabal and has the added benefit of regenerating ammunition. Disarming mines or taking down Vip’s can be a challenge with the Cabal rockets raining down on you. Move together to the different objectives and use your heavy weapons to clear out any nearby cabal. If you have a titan with you, have them setup a shield on the mine or use it to recharge your health. Despite their lumbering appearance, the Cabal can move around the map pretty fluidly by using their jetpacks. When on the high ground beware jet-packing legionaries that could flank you. Any team composition can beat any arena, but there are certain combinations that will complete them far more easily and in less time. The Cabal Arena is great for Titans because of the many rockets you’ll be attempting to dodge while completing objectives. If you’re a hunter, blade dancer may be the best bet as it allows you to move across the map stealthily to deal with mines. Warlocks can go either way, but because of the benefit of having a lot of solar damage abilities to deal with the cabal shields, best to stick with Sun singer.